Android tablets are great, but they're difficult to read in bright lighting conditions, the backlight screens can cause insomnia, and let's face it, it's too easy to get distracted by Angry Birds, videos, and other eye candy. If you're looking to get some serious reading done, you're better off getting an ebook reader which runs Android - like the Nook Glow, Sony Reader Wifi, or the Onyx Boox T68 Lynx. Not everyone likes to spend all of there time reading ebooks, but luckily these ereaders offer the option of installing other apps. And based on my time with the T68, I think it offers the most options. It runs Android 4.0. That's a newer version of Android than you can find on most E-ink devices, and since it ships with Google Play you have the least hassle in finding and installing apps. Here's a list of apps which have been tried by T68 Lynx owners and found to work. Opera Mini - The T68 Lynx ships with the stock web browser; it works okay but I think we can do better. Google Play will tell you that Chrome and Firefox aren't compatible with the T68 Lynx, and sadly Opera Mobile tends to crash. But Opera Mini works, and it offers a better interface with an E-ink-friendly drop down menu, zoom buttons, and other improvements. Gmail - When I said that you can read on the T68 Lynx, I didn't mean just ebooks. The Gmail app in Google Play can be installed on this ereader. It works just fine for me, and it even runs in the background just like it is supposed to. I've even used the onscreen keyboard to send a couple emails. Kindle - What kind of a post would this be without mentioning the king of all ebook apps? The Kindle app from Google Play installs and it works almost perfectly. You can read, buy ebooks, and take notes, but there is a catch. The Kindle app doesn't work with the page turn buttons, and there's no way to disable the page turn animation (trust me, we've tried) but on the plus side the Kindle app is faster at page turns than the ebook app which Onyx shipped on the T68 Lynx. Moon+ Reader - Quite a few ebook apps work on the T68 Lynx (including Kobo, Aldiko, Alreader, and more) but I want to single out Moon+ Reader as your best option. Like the Kindle app it is faster than the stock reading app, and it also offers Dropbox integration and a theme that looks okay on a grayscale screen, and it even works with the page turn buttons. This is the ebook app you should be using, not the one that Onyx provides. Scribd & Oyster - As a reader just reminded me, you can install the ebook apps for both of these ebook subscription services. RepliGo, Adobe Reader, and ezPDF - The T68 Lynx already supports PDF out of the box, but don't let that stop you from installing additional PDF apps. All 3 of these apps work well on the T68 Lynx, and RepliGo works great. it offers an easy to read interface and calmly handles 200MB graphic novel PDFs. I don't think I am overselling it when I say that you should take a pass on that next cup of coffee and buy RepliGo instead. it's that good. Pocket, Readability (& Instapaper?) - One lament shared by Nook Glow owners is that the offical clients for Readability and Pocket don't work on their device. But since the T68 Lynx runs a newer version of Android, you can run the official apps as well as third party apps. I have run both Pocket and Readability, but I can't speak for Instapaper. Google Play says it is compatible, but I can't find anyone who has tried it. Comixology - I found that I preferred to read comics in RepliGo, but if you are really into comics then you'll be pleased to know that the Comixology app works. I only have a few titles with that service, but I was able to download them and read just fine. Evernote - In case I haven't disabused of the idea that this is a mere ereader, Evernote is usable on the T68 Lynx.At the request of a reader I logged in and added notes to my long-dormant account. The T68 lacks a speaker or a mike, so some types of notes won't work, but you can review and add to your notes. I've only just touched the surface of what you can do with the T68 Lynx. There are other reading apps which you can install, and while you're in Google Play you might want to install utilities like ES File Explorer, Dropbox, and the like. 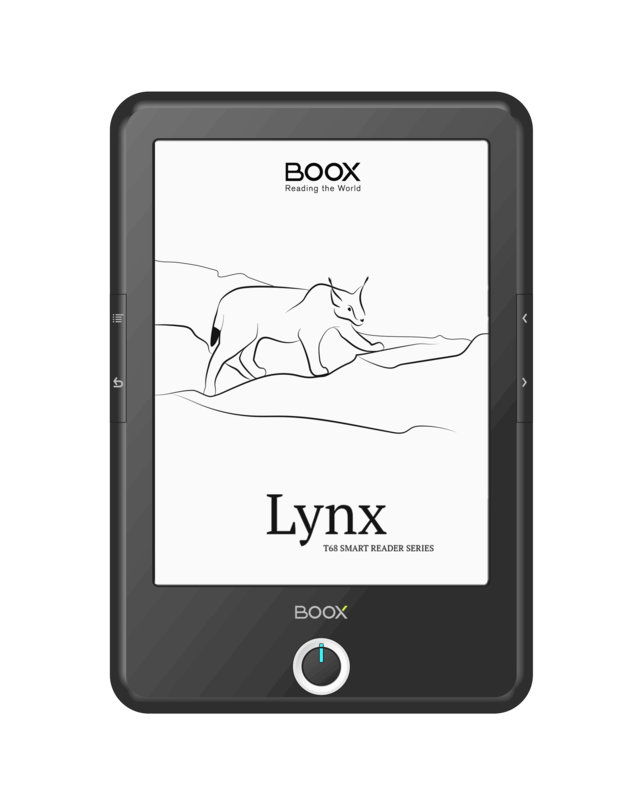 Sure, you may be planning to use the T68 Lynx as an ereader but you will still need to manage it like you would an Android tablet. So tell me, How do you like to read on the Android-based ereader? Nate, have you personally tried this with Scribd or Oyster? Great, and neither can I. This isn’t a whine, nor a my-choice-is-smarter-than-yours comment. Just FWIW. A couple of years a go I came to the startling revelation that I’m getting older all the time. Part of that is visual acuity. I have a Nook wGlo and for me, with my failing eyesight, it’s just not yet good enough. I read by choice on my Nook HD. I understand why people say they don’t like backlit tablets, I don’t mind reading for hours on a backlit screen, but I understand the point that it bothers some people. But if they ever come up with a real paperwhite high contrast ereader, I’ll pay attention. I’m talking about a screen that looks as good as the ads. (BTW, Nate, you pictures in this post are honest representations of an ereader screen – thank you for that). I wonder whether the impossibility to disable pageturn animation in Kindle app is just their usual “let’s disable any reasonable configuration option, because our typical user is very stupid” or whether it is a clever plan prepared for Android devices with e-ink. To be honest, skeumorphic features like animated pageturns, unreasonably wide page margins, paper-like backgrounds and fake wooden shelves annoy me under the best of circumstances. Why can’t they give us an “Advanced configuration” hidden deeply somewhere in the menu (or inside a configuration file that can only be edited by a built-in vi editor 😉 ) that would let us use our own fonts, justification, line spacing, reasonable margins or even … GASP … hyphenation or hierarchical directories? This seems to be the approach Amazon uses in their e-readers. Did you try to run Angry Birds or some other animated app? I think this device comes with black & white only no-flash mode. Have you tried it? Angry Birds won’t show up in Google Play, and the apk I found elsewhere won’t install. I didn’t try any other app. Okay. But have you tested the monochrome no-flash refresh functionality? The effect will be visible in apps that scroll, like a browser for example. You could also try playing a video on it…Obviously the monochrome limits, but still, it’s an important functionality. That is one of the modes which caused the Kindle app to fail, so I generally avoided using it. It looks terrible so I had no interest in it. The Overdrive app works well, I downloaded a library book and turned off page animation. Google Play books installs, but you can’t turn off page animation so it looks pretty bad. Mantano works ok, it seems to have a page animation if you tap on the left of the screen but looks way better than Kindle, Scribd or Google. Calibre Companion works very well, I have 800+ books on my T68 now. If you use Calibre, Calibre Companion is a must have for organizing your books on your device. I also installed InoReader and it works very well. Tapatalk installs and works too. I had trouble with Opera mini – I couldn’t make the fonts big enough and it crashed too. You can’t install Dolphin mini through the Play Store, but I installed it on my Nexus 7 and restored it using Titanium Backup to the T68 and it’s working better than Opera Mini. Yes, Titanium Backup works if you’re rooted, but the text is not visible in a number of places. Amazon appstore, Dropbox, Swapps, Gsam battery monitor, and Thumb Keyboard all work. I am running out of space to install more apps! I have moved everything that allows it to the sd card. The one issue in multiple apps is a problem where text doesn’t show up on some menus – a sort of white text on white background, but usually in areas you won’t need often. I bought one of these and it’s practically unusable. I can’t get through a single comic with Comixology without it rebooting. And apparently if the battery is low (below 20% or so) it’ll just go into a reboot loop until you find a charger. I can’t express how disappointed I am that I’ll have to return such an interesting concept for a device. I am seeing similar erratic behavior with the battery meter, alas, but I didn’t have any issues with Comixology. Could someone please test whether Google drive/Google docs works for taking notes? That’s my main notes taking solution at conventions, but I do tons of epub reading at night and WANT an e-ink tablet with Google play. Also does Google play books work? Google Drive doesn’t work well, but it works. It crashed the first time I tried to use it, and when I opened it the second time it took several minutes to show me my files. But I was able to download one. Google Docs seems to have frozen during the install process. Is there any very simple word processing app – I am thinking something like Word Pad on Windoze or Gedit on Linux? I am thinking of using this at a construction site for reading and writing, but the writing can be basic and without fancy formatting options. RepliGo is no longer available. I generally use PerfectViewer for comics. Has anyone tried it on the T68? Picked the T68 up because I wanted an e-ink ereader, and my library is scattered across Kindle, Nook, Play Books, and Dropbox. This was the only device I found that had a new enough version of Android to install all of those apps, so I went ahead and bought it. It’s true that the Kindle and nook apps aren’t well supported by the device (page animations, and control options being my main concerns), but I discovered (after using it for a few weeks) that it automatically loads all of the compatible files into the library. Since the discovery, I’ve just been using the other apps to download the books I want to read, and using the built in reader to read them. I’ve had problems with a few of the books (either formatting issues, or a lack of visible content when opened in the local app), but I suspect that’s an issue that’ll be resolved with a limited amount of troubleshooting (when I’ve run out of other books to read). Thank you for the tips on other apps to install. I’d completely forgotten about the Overdrive app, and plan to check out Opera shortly. Anyone know how to make changes to the shortcut bar at the bottom of the screen? I’d love to place frequently used apps down there. July: $2.875 million fund, $1.81 payout. August: $4.7 million fund, $1.54 payout. September: $5 million fund, $1.52 payout. October: $5.5 million fund, $1.33 payout. Each month, the KOLL global fund increases, yet the KDP Select payment decreases. This suggests that the Kindle Unlimited readership is consistently growing. If significant numbers are dropping out after the free 30-day trial, I don’t see the indication of this. does any one personally tried facebook on t68 lynx ?